LinuxForce’s web hosting services are designed to provide our customers with the benefits of strong security, simple on-going administration and maintenance, and support for the web software to work well in a large number of situations including multi-site support for applications. We achieve these objectives by operating a Debian infrastructure with close adherence to Debian’s policy, web application policy and PHP policy. In particular, we use the Debian package for Drupal 6. This provides community supported upgrades with a strong, well-documented policy. Like other software which ships in Debian, the software version is often somewhat older than the most recent upstream release, but it is regularly patched for security by the maintainer and the Debian security team. Experienced Drupal admins may find some of the file locations for the package confusing at first, so let’s clarify the differences to ease the transition. All of these are configurable by the user, and are located in /etc/drupal/6/sites/drupal.example.com/. The site also inherits the contents of these default directories from core Drupal. Access to these files via FTP is discussed below. Core Drupal files are located in /usr/share/drupal6/ and are shared between all the Drupal sites on the server. They should not be edited since all changes to these files will be lost upon upgrade of the Debian Drupal package. A jailed userdrupal FTP account is created to manage the files for the Drupal install. All files (with the exception of dbconfig.php) should be writable by userdrupal, the userdrupal group itself is enforced by the system but all users should be configured client-side to respect group read-write permissions to maintain strict security, this is a umask of 002. If there is a non-developer who needs to have access to the files directory, for instance, a specific FTP user for that use may be created and added to the userdrupal group. For ease of administration, if multiple users exist and we are able to support an ssh account (static IP from client required) for handling administration, sudo can be configured to allow said user to execute commands on behalf of the userdrupal ftp user. Remember to add “umask 002” to the .bashrc to respect group read-write permissions. Although the Debian way differs from the Drupal tarball approach, it makes it possible to scale the service to many sites saving disk, memory, and sysadmin effort. By leveraging this Drupal infrastructure provided by Debian, Linuxforce provides one-off Debian package deployments to dedicated systems, shared arrangements for small businesses who are running several sites, and infrastructure deployments for businesses who provide hosting services. We also offer a boutique hosting service for select customers on one of our systems. In September Laird Hariu wrote the article “File Servers – The Business Case for High Availability” where, in addition to building a case to use clusters, he also briefly outlined how Debian and other FOSS could be used to create a cluster for a file server. File servers are just the beginning, we have deployed clusters which host web, mail, DNS and more. The core of this infrastructure uses Debian 6.0 (Squeeze) 64-bit and then depending upon the needs and budget of the customer, and whether they have a need for high availability, we use tools including Pacemaker, Corosync, rsync, drbd and KVM. Management of this infrastructure is handled remotely through the virtualization API libvirt using the virsh and Virtual Machine Manager. The ability to use such high-quality tools directly from the repositories in the stable Debian distribution keeps our maintenance costs down, avoids vendor lock-in and gives companies like ours the ability offer these enterprise-level clustering solutions to small and medium size businesses for reasonable prices. There are dozens of virtualization products on the market. 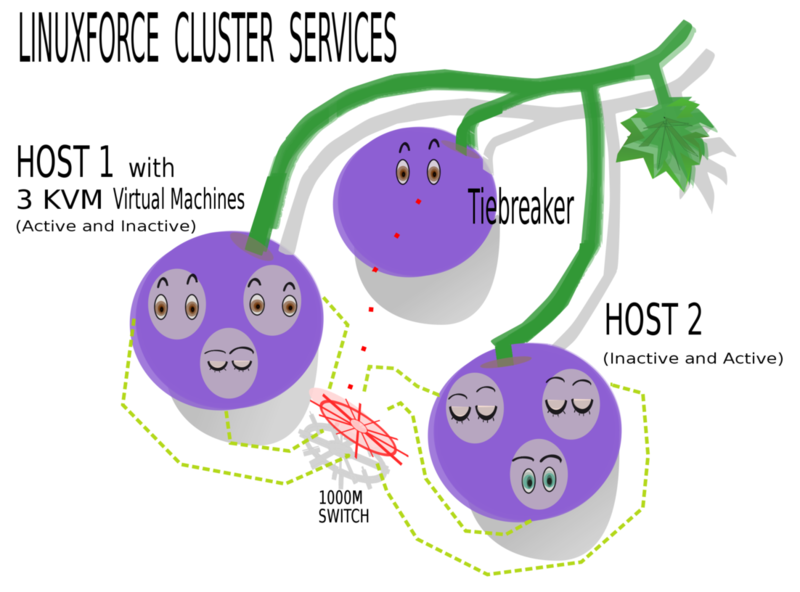 When we launched our first high-availability cluster in early 2008 we chose Xen due to it’s ability to run on non-virtualized hardware, support in Debian 4.0 (Etch) and general flexibility. We’ve learned a lot about the upstream of Xen, including the challenges that Debian maintainers face, and we were increasingly drawn to another free and open source virtualization technology, Kernel Based Virtual Machine (KVM). The primary downside to KVM is that it requires special CPU hardware support to run, but this hardware support is now almost ubiquitous on modern servers. KVM has the advantage of being supported upstream in the Linux kernel itself, removing the onus of difficult kernel patching from the Debian Developers and has become the supported virtualization option for Ubuntu, Fedora and Red Hat. Additionally, KVM allows the guests to run unaltered, meaning you don’t need a special kernel and can run many OSes, from Linux to FreeBSD to Windows 7. In Xen, partitions were created in separate logical volumes on the host and mounted by Xen itself and as a result we didn’t require Logical Volume Manager (LVM) within our Xen guests, in KVM the logical volume on the host for a virtual machine is a single disk image, not separate partitions. 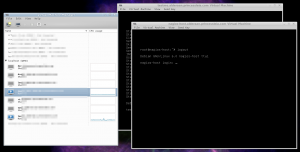 The first step was to create a partition table on the new KVM image which is identical to the one on Xen. We wanted to use LVM within the guest, which required a Matryoshka (Russian) doll approach. First we’d create a volume group on the host to give us the typical flexibility of LVM host-side, and then we’d create one on the disk image giving us the flexibility required within the guest itself to expand any partitions. Finally we’d need to bootstrap the new system and copy the files over. One way to go about all of this is a manual process. This solution would allow for scripting the procedure but requires a significant investment of time to get everything right so there is the least amount of down time possible. Since we only have a half dozen of these VMs to migrate in total, we looked for some way which already existed for handling all these steps in a familiar way, which is when we looked to the Debian Installer. Assuming a local mirror of core Debian packages (recommended), we could install a skeleton system on a test IP address which was properly partitioned, had LVM configured and bootstrapped in less than 20 minutes. We could then take this skeleton system that we’re sure is an functioning, bootable system and move the files over from the Xen installs, arguably decreasing our risk with each migration and the downtime required. In this example we assume the debian-506-i386-netinst.iso is in /var/lib/libvirt/images/ and we want 768M of RAM, the information you put here is similar to the information that you would have previously defined in your /etc/xen/guest.example.com.cfg file for Xen. Then use virt-manager to connect (we actually connected from a remote desktop running virt-manager) to the running install session (the standard Debian installer does not provide serial access) and install Debian, you will need the root password to launch the installer. Proceed to install. When you get to the step to partition the disks, lay out the partition table to be identical to the VM you want to migrate to it except put it on LVM, put /boot on a separate partition outside of LVM. Complete the install, including installing grub. Confirm that the system will boot and works on a test IP address and make a copy of your /etc/fstab to the host system, you’ll need this later. You now have a skeleton install of Debian which runs on KVM with the LVM partitions you need. In this example we assume the Linux Volume on the host is called “guest.example.com” and the Linux Volume within the guest is called “guest”. Now that the host can see the Volume Group on the guest, and all the Volumes in /dev/mapper/ you’ll want to mount them. Once mounted, you’ll be able to start your rsync. To incur the least amount of downtime, you’ll want to rsync the large data partitions (like /srv, /home, /var, perhaps /usr) while your production host is still running. Note: All rsyncs completed during this process must be done with the “–numeric-ids” option so the permissions are not inherited from the host! When you’ve completed moving the largest portions of your Xen guest, bring down the production Xen guest (downtime starts now!) and mount the filesystems. And begin rsyncing the data over (preferably over a crossover cable for the fastest transfer, remember to use –numeric-ids in your rsync). You’re now ready to boot the VM on the KVM side. This can be done with virt-manager or virsh. Since you just moved the machines to a new server, and probably new MAC addresses, you will probably need to run the arping command to reclaim the IP address of the VM and all its service IP addresses. Now that we’ve completed one of these migrations we have a lot of ideas about how to improve the process, including the possibility of making the whole process more scriptable, but this quick method leveraging the Debian installer for easier disk configuration and bootstrapping worked very well. We have all heard this: You need to document the computer infrastructure. You never know when you might be “hit by a bus”. We hear this and think many frightening things, reassure ourselves that it will never happen and then put the request on the back burner. In this article I will expand on the phrase “hit by a bus” and then look at the consequences. Things do happen to prevent people from coming into work. The boss calls home. Talks to the wife and makes the sad discovery that Mike wont be coming in anymore. He passed away last night in bed. People get sudden illnesses that disable them. Car accidents happen. More often than these tragedies occur, thank goodness, business conditions change without warning. In reorganizations whole departments disappear, computer rooms are consolidated and moved, companies are bought and whole workforces replaced. I have had the unhappy experience of living through some of this. Some organizations have highly transient workforces because of the environment that they operate in. Companies located near universities benefit from an influx of eager young, upwardly mobile university graduates. These workers are eager to gain experience but soon find higher paying jobs in the “real world” further away from campus. These companies have real turnover problems. People are moving up so quickly, they don’t have time to write things down. Even when you keep people in place and maintain a fairly stable environment, people discover that what they have documented in their heads can just fade away. This is getting to be more and more of an issue. Networks and servers and other such infrastructure functions have been around for 20 years in many organizations. Fred the maintainer retired five years ago. Fred the maintainer was transferred to sales. The longer systems are around, the more things can happen to Fred. Fred might be right where he was 20 years ago. He just can’t remember what he did. What does all this mean? What are the consequences of losing organizational knowledge in a computer organization? To be blunt, it creates a hideous environment for your computer people. The system is a black box to them. They are paralyzed. They are rightfully afraid. Every small move they make can bring down the system in ways they cannot predict. Newcomers take much longer to train. Old-timers learn to survive by looking busy while doing nothing. The politics of the shop and the whole company is made bloody by the various interpretations of the folklore of the black box. He/she who waves their arms hardest rules the day. This is no way for your people to live. This is no way for the computer infrastructure to live as well. While the games are played the infrastructure evolves more slowly and slowly. Before long the infrastructure is frozen. Nobody dares to touch it. The only way to fix it is to completely replace it at considerable expense. In elaborate infrastructures this is easier said than done. The productive lifetime of the platform is shortened. It was not allowed to grow and evolve to lengthen its lifetime. Think of the Hubble Telescope without all the repairs and enhancements over the years. It would have burned out in re-entry long ago. Having made my case, I ask again; for your own good, please document the shop. Make these documents public and make them accurate. Record what actually is rather than what you wish it to be. It is better to be a little embarrassed for a short while than to be mislead later on. Update the documentation when changes occur. An out of date document can be as bad as no document at all. Make an effort to record facts. At the same time don’t leave out general philosophies that guided the design and other qualitative information because it helps your successors interpret the facts when ambiguities occur. Think of what you leave behind. Persuade your boss to make this a priority as well. Hopefully the people at your next workplace will do the same. Last year a client asked us for advice on getting started with programming. So I thought I’d share some thoughts about programming, its relationship with FOSS (Free and Open Source Software) management and why Python is a good language for learning programming including some great on-line resources. But first I want to make sure our business-oriented readers understand the nature and importance of source code. The “source” aka “the code” provides a language in which computer users can create or change software. One does not have to be a programmer to work on the code. In fact, every computer user is, ipso facto, a programmer! Menus, web interfaces, and graphical user interfaces (GUIs) are some of the more facile “languages” for computer programming that everyone, even children, can readily learn and use. Of course, building complex software systems requires a more expressive specification language than a web form, for instance, can provide. Although all computer software is specified with source code, FOSS systems are unique in that the source code is made available with the software. In contradistinction, software lock-in or vendor lock-in describes the unfortunately all too common practice of many organizations to block access to their source code. Having access to the source code provides huge operational benefits. For one, the source can be used to understand how the software works: it is a form of software documentation (indeed, it is the most definitive form of software documentation possible!). Also, code can be easily changed to add diagnostics or to test a possible solution to a problem or to modify or add functionality. In addition, the source is a language both for specifying features to the computer and for discussing computing with others. So most mature FOSS languages have vibrant support communities in which one can participate, learn and get help. The source is a tool: a powerful, multi-purpose, critically important tool. Since LinuxForce focuses on FOSS, we are able to take full advantage of the availability of the code. We are always working with the source! Since most of our work is systems administration, we usually “program” configuration files. However, we also write systems software and scripts and we support software developers extensively, so we have a persistent, deep, and productive relationship with code. But what to suggest to someone like our customer who wants to learn programming? I remembered seeing a blurb in Linux Journal referencing an article they published in May 2000 by Eric Raymond entitled "Why Python" which argues persuasively for the virtues of the programming language Python. I had often felt that Perl‘s idiosyncrasies made it difficult to use, so Eric’s critique of Perl and accolades for Python were convincing to me. In addition, I follow FOSS mathematics software and I was aware that Sage is a Python “glue” to more than fifty FOSS math libraries. I’ve been meaning to look into Python so I could use Sage. Another pull comes from my work at LinuxForce where we use a lot of Python-based software including mailman, fail2ban, Plone, and several tools used for virtual machine management such as kvm, virtinst and xen-tools. Python has a huge software repository and community. So one is likely to find good libraries to build upon (thus avoiding the extra learning curve of building everything from scratch). Python is an interpreted language which makes it easier to debug and use so the learning process is smoother. To finish the recommendation, I just needed to find some on-line resources. First, Kirby Urner suggested these two: Wikieducator’s Python Tutorials and "Mathematics for the Digital Age and Programming in Python". Then, I checked out the Massachusetts Institute of Technology’s (MIT) OpenCourseWare which provides extensive course materials for many of their classes (I’ve already watched the full video set for a couple of MIT’s courses including the legendary Walter Lewin’s "Classical Mechanics" and have been very impressed by the quality and content of their materials). After nearly 30 years of introducing students to programming with Scheme, MIT switched to Python in 2008! The materials for their introductory Python-based course "6.00 Introduction to Computer Science and Programming" are very thorough, accessible and helpful. Their free on-line materials include the full video lectures of the class plus assignments, sample test problems, class handouts, and an excellent Readings section with references to "the Python Tutorial" and a very good free on-line textbook "How to Think Like a Computer Scientist: Learning with Python". In conclusion, if you or anyone you know wants to learn how to program computers, I recommend starting with Python using MIT’s on-line course materials supplemented with the other on-line resources mentioned above (and summarized in the table below). I’ve now watched more than half of the videos from the MIT 6.00 course and I’ve worked through several of their assignments: this is a great course! Even with nearly three decades experience programming including a couple of college-level courses in the 1980s, I’m finding the class is more than just good review for me: I’ve learned a few new things (in particular, dynamic programming and the knapsack problem). Python’s clean syntax and elegant design will help as one delves into writing code for the first time. Its extensive libraries and repositories will support the application of one’s newly acquired computing skills to solve problems in the area of the student’s special interests whatever they may be … and that’s the way we learn best: by doing something that we personally care about! MIT’s Course 6.00 Introduction to Computer Science and Programming including complete video lectures about learning Python and programming. Eric Raymond’s May 2000 Linux Journal article "Why Python"
Blocking e-mail spam at the time of SMTP (Simple Mail Transfer Protocol) transfer has become a best practice. There is no point wasting precious bandwidth & disk space and spending time browsing a huge spambox when most of the incoming flow is clearly spam. At LinuxForce our e-mail hygiene service, LinuxForceMail℠, makes extensive use of SMTP blocking techniques (using free and open source software such as Exim, Clam AV, SpamAssassin and Policyd-weight). But we are extremely careful to only block sites and e-mails that are so “spammy” that we are justified in blocking it. That doesn’t prevent false positives, but it keeps them to a minimum. Recently we investigated an incident where one of our users had their e-mail blocked by another company’s anti-spam system. In investigating the problem, we learned that some vendors support an option to block e-mail whose Received header is on a blacklist (in our case it was Barracuda, but other vendors are also guilty). Let me be blunt: this is boneheaded, but the reason is subtle so I can understand how the mistake might be made. First, blocking senders appearing on a blacklist at SMTP time is good practice. But to understand why blocking Received headers at SMTP time is bad, it is important to understand how e-mail transport works. The sending system opens a TCP/IP connection from a particular IP address. That IP address should be checked against blacklists. And other tests on the envelope can help identify spam. But the message headers including the Received header are not so definite. We shall see that even a blacklisted IP in these headers may be legitimate. So blocking such e-mail incurs unnecessary risks. The problem occurs when a user of an ISP (Internet Service Provider) sends an e-mail from home, they are typically using a transient, “dynamic” IP address. Indeed it is possible that their IP address has just changed. Since the new address may have been previously used by someone infected with a virus sending out spam, this “new” IP address may be on the blacklists. So, due to no fault of your own, you have a blacklisted IP address (I will suppress my urge to rant for IPv6 when everyone can finally have their own IP address and be responsible for its security). Now, when you send an e-mail through your ISP’s mail server, it records your (blacklisted) IP as the first Received header. So your (presumably secure) system sending a legitimate message through your ISP’s legitimate, authenticating mail server is blacklisted by your recipients’ overambitious anti-spam system. Ouch. That is why blocking such an e-mail is just wrong. This kind of blocking creates annoying unnecessary complications for the users and admins at both sides. Using e-mail filtering to put such e-mails into a spam folder would be a reasonable way to handle the situation. Filtering is able to handle false positives whereas blocking generates unrecoverable errors. Do not block e-mail based on the Received header! You are currently browsing the archives for the Systems Management category.